Hummus, houmous, humus, however you spell it this wonderful Lebanese dip made from chickpeas, garlic, lemon and tahini is one of my favourite things. My go-to snack is crisps dipped in hummus and when it comes to variety I definitely have my favourite shop bought one, but freshly made hummus at home is something so wonderful and remarkably easy too! This hummus consists of roasted garlic for a richer flavour, it's so smooth and creamy and tastes just fantastic! I served my hummus up with garlic and coriander pita and some fresh carrots, but you could also have it with crisps, crackers and even on pasta. I've been eating more than my fair share of hummus lately so I thought it was about time that I shared a recipe with you all! 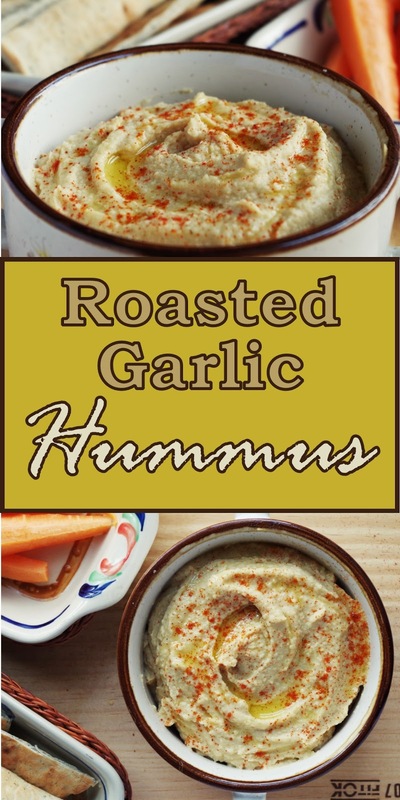 The garlic takes around 40 minutes to roast, but the whole process of making this dip is so easy that once the garlic is roasted you can have freshly made hummus from start to finish in less than 5 minutes! Though this dip contains fat in the form of sesame seed paste (tahini) and extra virgin olive oil, if you portion it out there is nothing to worry about; these are good fats! Tahini contains essential omega 3 fatty acids and the mono-unsaturated fatty acids from the olive oil have been shown to have positive effects on blood cholesterol level and contain antioxidants. So, like everything, moderation is important as fats have the highest calorific content per gram of all the food groups, but unsaturated fats are important components of our diets and are not the enemy! As the dip is made of chickpeas it is also high in protein and iron - therefore, home made hummus is not only smooth, creamy and delicious but it's good for you too! When picking the tahini, aim to select a whole-seed variety - I used a whole-seed raw tahini, delivering maximum nutritional benefit of sesame seeds. It is also easier to roast a garlic bulb whole, so you'll have some leftover roasted garlic for another day. Pre-heat the oven to 200°C. Chop about 1/2 cm off the top of the garlic bulb, wrap in foil, place on the baking tray and roast for 40 mins. Then carefully peel the paper and skin away for 4 cloves of garlic and place in the food processor. Rinse the chickpeas and place in the food processor with the rest of the ingredients, blitz until smooth and transfer into a serving bowl/plate. Drizzle with extra virgin olive oil and sprinkle with smoked paprika, serve up with sides of choice and enjoy!